Well today I was in Bucks County Pennsylvania so that usually means a trip to one of my favorite thrifty shopping spots, Habitat for Humanity's ReStore. 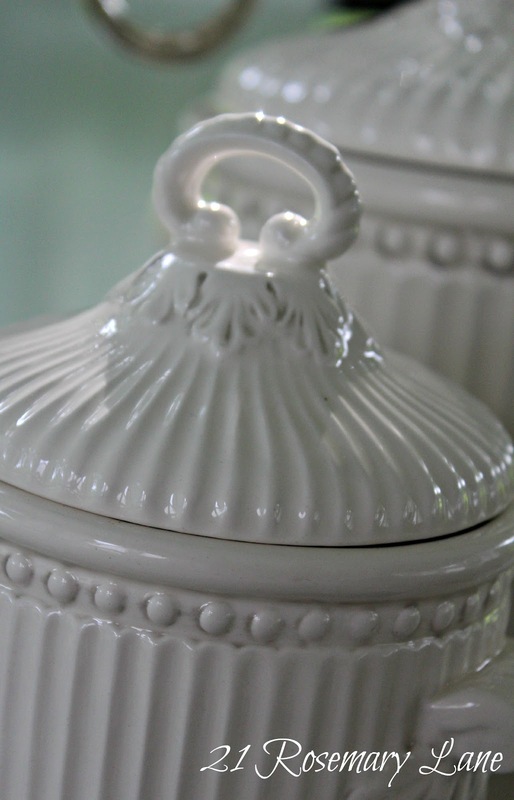 I've been looking for new white canisters for my kitchen, so when I saw these three American Antelier canisters for only $9.75 I immediately picked them up. I think thier shape is rather unusual, quite different from the typical shapes of round and square. And since I had never heard American Antelier, I Googled the make and style only to find that they were sold last August on ebay for $80! I was feeling pretty good about that buy. The 3 arm candlestick I purchased for 12.99. It's silver-plated and made by a New York company call Godinger Silver Art Co. Ltd. I'm planning on putting it on the back patio table to give the space a little bling! You have to really look when shopping places like ReStore, but it is well worth it when you bring home treasures like these! Oh and by the way remember to stop back Monday morning for my giveaway worth $40!!! We have a Restore not too far away from us and I keep meaning to get over there but never seem to have enough time to. I guess I need to make some time to go and check it out!! I have different canisters by the same company. They went out of business not to long ago. I use to shop at their warehouse in Jersey. You got a fantastic buy!!! Love the canister set! I have a collection of Godinger crystal, I wonder if they are the same maker as your awesome candlestick? I may have to make plans to visit the restore here. I hear they carry home furnishing items. I'd love it if you shared this at my party on Tuesday! I had no idea restore carried stuff like that... I've been meaning to stop by our local one, but haven't yet. Great finds!!! What wonderful finds. That candelabra is so cool and I love all things white and classy. So beautiful!! Our habitat does not sell those type of wonderful goodies! Great finds! Those canisters will look amazing in your kitchen! Those are beautiful! And a steal too! Awesome deals that you found here and thanks for sharing at NTT. We've got a ReStore full of old cabinets and tile and such (which I do love), but not one with items like these. For that I have to visit the one near my parents in Pt. Townsend, WA. THis has me inspired to make a trip ASAP! What a deal you found! I found my daughter the plates from that collection at our restore last year for $1 each and they go for $30 plate. SCORE! Found a few more at salvation army so now she has a collection of 9 plates. LOVE the ReStore...that's were I get most of my treasures! Wow! What great treasures you found! And, at fabulous prices! Our Habitat store has increased prices to nearly ridiculous. It is refreshing to see that some stores still price appropriately for thrift stores. 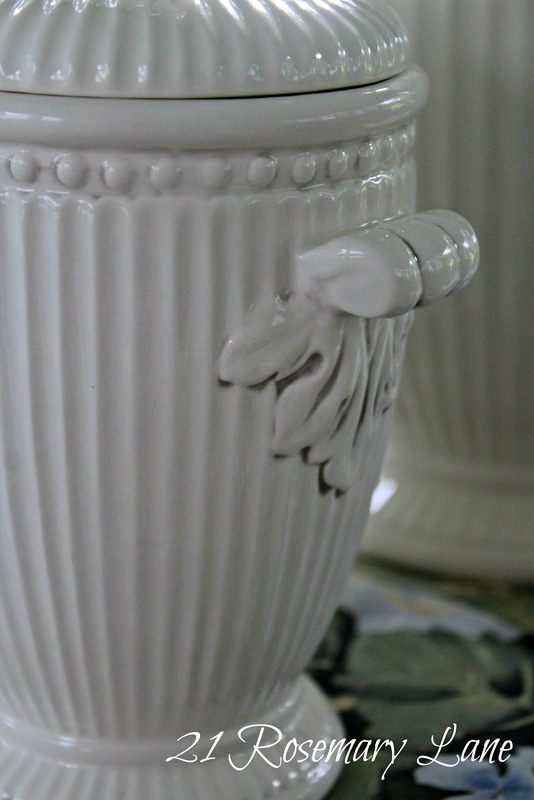 Ohhh...what great treasure finds and at such great prices too! 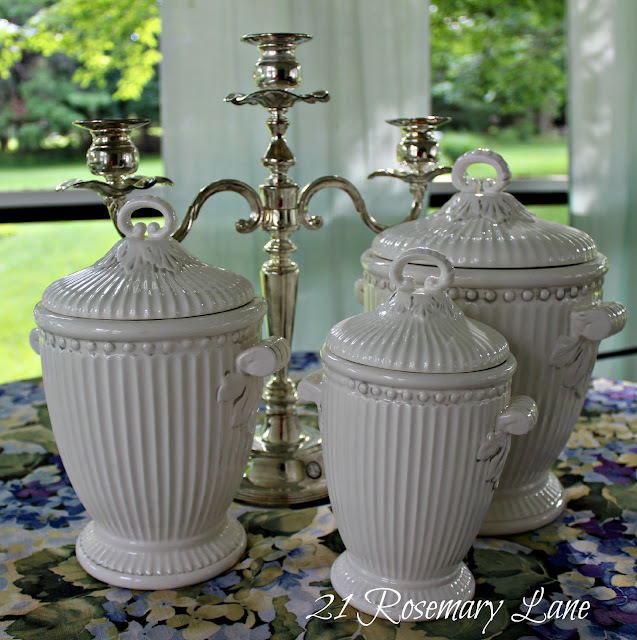 I love the white canisters...very pretty and the silver candelabra just makes my heart sing! Thanks for sharing your new pretties with us today! PS...I believe that this is the first time that I have visited your delightful blog...it's so very nice to meet you! Lovely items! Those canisters are just gorgeous and the candelabra is just perfect for an outside setting. I wish we had one of those stores close by! 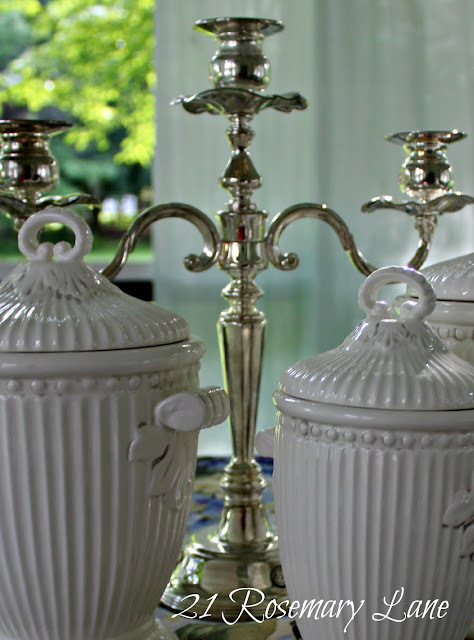 Love the canisters and WOW, what a price on them and the silver. Perfect! What great finds!! I love them! The canisters are gorgeous! I love the detail! What treasures you have found!!! 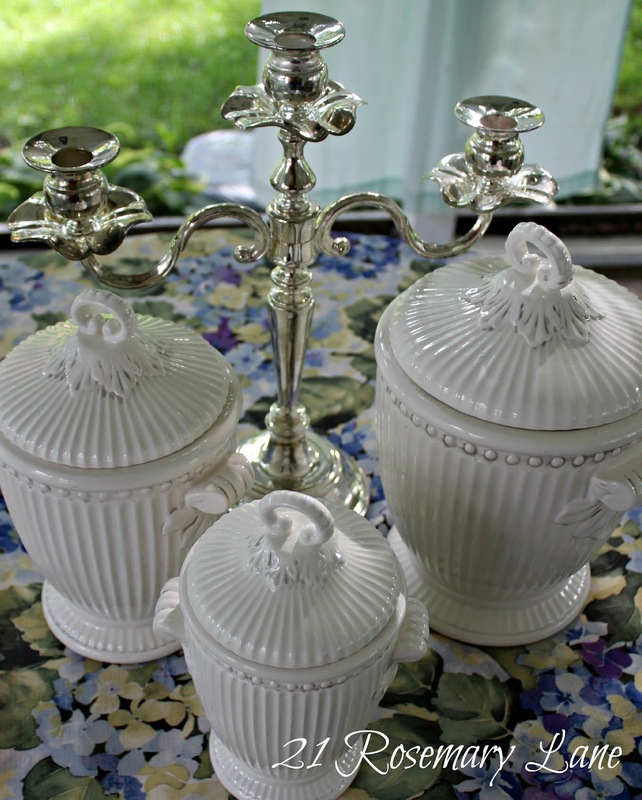 Great finds, specially like the candlestick. Got to LOVE a restore. I love those cannisters, & what a great find! I've actually been looking for something similar for our master bath to conceal some of those "bathy" essentials. Wow, what great finds! You just never know! I love the restore. You found some really great things. Love the canisters. Beautiful finds, Barbara! I love those canisters. I have seen similar that are ridiculously expensive - like $100.00 and higher! Hey Barbara - how are you. Lucky you going to Bucks County. I've only been there once - love it! Great finds! I saw you were featured on Coastal Charm - congrats!